The Lewisham NHS Choir who've we've been following on BBC2's The Choir (Sing While You Work) may not have won at the final (screened last night) but they've certainly got something to sing about now, more than ever. If we ever needed a choir it is now, since it is almost official: the newly refurbished Lewisham A&E is about to be closed, as reported on BBC News tonight. Lewisham borough patients will have to go to the Queen Elizabeth in Woolwich (part of the heavily PFI indebted South London Healthcare Trust) so that it can justify its existence. Other services may follow and most at threat are maternity and surgical. 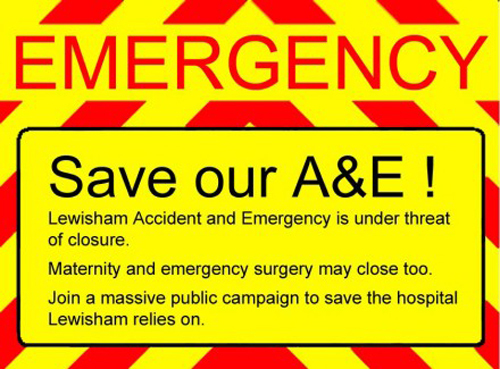 If the newly-refurbished Lewisham A&E closes, the boroughs of Lewisham, Greenwich and Bexley will have one accident and emergency to share. This is not a ‘difficult decision’ that the government is making, it is a ‘deadly decision’. Go to www.savelewishamhospital.com to find out about what you can do to help, support and possibly change. First off is a public meeting on Thursday 8th November, 6-8pm at Lessoff Auditorium, Lewisham Hospital with speakers including the Mayor of Lewisham. UPDATE 30th October: Transpontine analyses the Special Administrator's draft report that was officially published today. Housing Matters - People Don't. Or at least that is the strong impression given by the latest Lewishambles mailout. Residents will by now have received a letter from Lewisham Homes with the wrong name on it. As my address has been used by persons unknown for mail order scams in the past, I simply wrote NOT KNOWN AT THIS ADDRESS - RETURN TO SENDER on the unopened envelope that arrived yesterday and put in straight in the post box. Some time later this email arrived in my inbox. You may have received the attached newsletter in an incorrectly addressed envelope. Please read this newsletter as it contains important information about the future of your home. We apologise for this clerical error and want to reassure you that your details are held correctly in our systems. If you would like to speak to TPAS regarding the Housing Matters consultation process please call 0800 731 1619. I know other people did not get this email - to be on the email list I think you would have had to have signed up to a ''getting involved'' programme some time ago. But the advice given is to ignore the name and read the post anyway. Because, Dear Resident, you or the name on the envelope don't matter, it's the address itself that counts. Personally, I'm not going to open mail that's not addressed to me and I don't think that it's up to someone I don't know at Lewisham Homes to tell me to either, just to get them off the hook for their organisation's incompetence. Houses and flats only matter because people live in them. As a version of the newsletter was attached to the email in PDF format, which can't be uploaded to the blog (or if it can, I've no idea how to), I wrote to the communications@lewishamhomes.org.uk address and asked them for an address where the newsletter could be found online. 24 hours later I'm thinking I should have addressed my email to incommunicado@lewishamhomes.org.uk for all the good writing did me - still no reply. Communications? A couple of notes of warning. It's not in the same format as the mailed version. Apparently, to read it in order, you have mentally fold it up, starting on the right-hand side of page one and then presumably you descend to the right-hand side of page 2 before returning to where you naively expected to be able to start reading it. large print, audio tape, BSL or computer disc. So, wrongly addressed letters, incorrect information, instructions to read other people's mail, a non-communicating communications department. Not a bad day's work, eh? 1) The communications addressees still haven't deigned to communicate. Your views matter. To access the Housing Matters consultation go to www.lewisham.gov.uk/consulations and click on ‘see all Council consultations’. The survey is open until 5pm on 30 November. While anyone can fill in the survey we are particularly keen to get the views of Lewisham Council/Lewisham Homes tenants and leaseholders and those who would like to be social tenants. Not that the link will get you anywhere. The spelling of consultation should give you a clue as to why not. So, after misaddressing the newsletter to who knows how many Lewisham tenants, they've now given us not one but two incorrect links. I think it's time to consider whether there is active sabotage going on here. The next Crossfields Tenants and Resident Association's meeting will be at 7.30pm this coming Thursday 25th October in the Pink Palace. You will recently have received 'Housing Matters', a newsletter from Lewisham council. Within this newsletter are different options for how council housing will be managed in the future. At the meeting on Thursday, someone from Lewisham Homes will be there to explain these different options and answer any questions, so come along if you are interested in finding out more. Also, this is advance notice that the TRA meeting the month after on Thursday 22nd November will be the Annual General Meeting, where we will elect people for the following year. Let me know if you would be interested in standing for a position (chair, treasurer, secretary, etc) and I will give you the full list of positions and more details of what's involved. There is free training available through Lewisham Homes, for example book-keeping if you're interested in being the Treasurer. 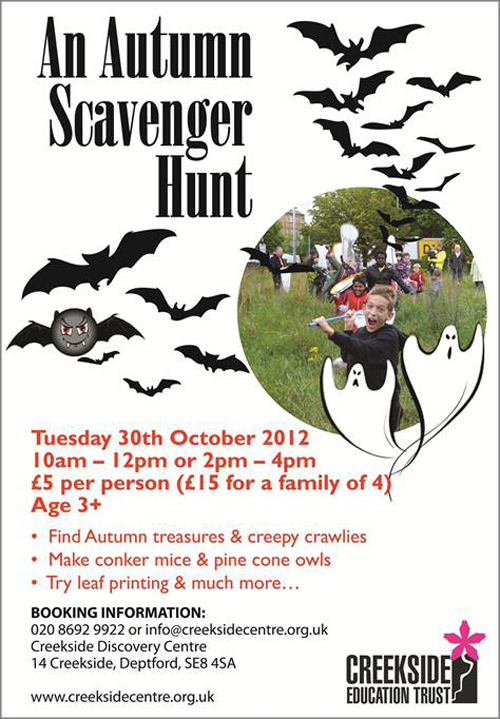 Creekside Discovery Centre have announced two Hallowe'en events. 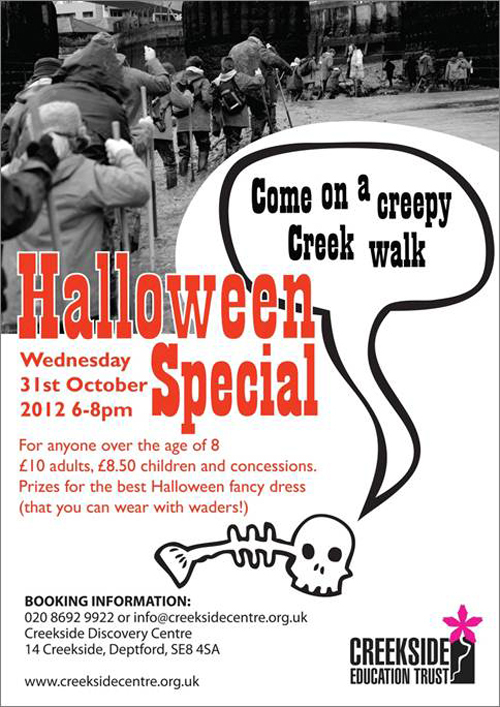 On the 30th October there'll be some spooky daytime activities for children and families, and on the 31st there's a low-tide 'creepy Creek walk' for adults (and accompanied older children) at 6-8pm – to our knowledge, the first ever trek up the Creek in the dark! Lewisham Borough Commander Chief Superintendent Russell Nyman will host his first live Borough webchat on Thursday 18th October between 6:45pm-7:45pm. The web chat, called Ask Lewisham, is a unique opportunity for members of the public to ask questions about policing issues in their local neighbourhood. The session will provide a unique opportunity for members of the public to put questions to their Borough Commander directly and to ask him about any concerns or queries they have about their local neighbourhood. The webchats are all part of the Commissioner's commitment to hear directly from the public to find out their views on how the MPS can be the best police service. Lewisham Borough Commander, Chief Supt Russell Nyman "This is a great opportunity to directly engage with the residents of Lewisham and find out about their concerns. I want to hear what they think about policing in Lewisham, what we are doing well at and what we need to do better at." People can pre-submit questions on Twitter using #AskLewisham. There is also a live webchat with the Met's Commissioner Bernard Hogan-Howe on Friday 19 October between 10.30 and 11.30am. You can join the discussion and pre-submit a question on Twitter using #AskMetBoss. Apparently, "More than 1,400 people have joined the Commissioner during his webchats, questioning him on a variety of topics including racism, drugs, uniform and terrorism. During the last webchat we received over one hundred questions during the hour long session hosted on the MPS website, and nearly four hundred people took part." A peek at Twitter at the time of writing reveals hardly anyone except Cllr Duwayne Brooks (LibDem, Downham) is pre-submmitting questions of Lewisham Met's new Borough Commander at #Ask Lewisham, whilst Lee Jasper is asking all the questions at #AskMetBoss. You can see/read the replay of the Lewisham webchat at the Met website. We've been meaning to write about this for ages, but never got round to it: how Lewisham Council intends to spend the £1.5m awarded by the Mayor of London's Outer London Fund to make improvements to the southern end of Deptford High Street. Now there's a drop-in event at Deptford Lounge on Wednesday 17 October (4-7pm) for you to find out for yourselves. You can read more on Lewisham's website. Also see Deptford Dame and Brockley Central. On the council website you can also fill in a survey that asks "What would encourage you to shop more often at Deptford High Street and Deptford Market?" and, having declared that the anchor is to be moved from its present position, ends with the question "Where do you think it should go?" 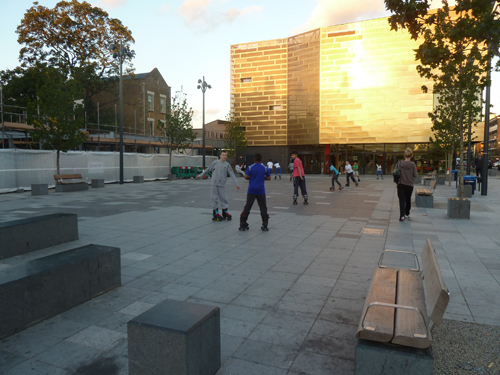 The Deptford Dame says there is a very obvious place to put the anchor – in the new skate park at Giffin Square (the kids can skate around it). She also points out that the plans show some nice new low-level seating, so the drinking community will still have a spot to perch. Whilst new lighting, better electrical connections, more trees and new drainage are all improvements to be welcomed, other plans may be less so. New paving will obviously improve the look of the place, but how many times must we get new paving, for it only to look dirty and terrible within a few weeks? Just look at Douglas Way now, it's absolutely filthy. The new paving in Giffin Square is already stained and never cleaned. And within days of being laid, new paving by the main road was being dug up by utilities whose obligation to return it as found was not enforced by the council with any vigour. Not to mention the paving already in the high street which has been filled in for years with tarmac by Lewisham themselves (as is most of the paving elsewhere in the borough). And what is the point of new paving when there is no proper cleaning up (ie jet washing) after the three-day-a-week market? What is the point of new lighting when the lighting is never properly maintained? What is the point of new trees when they are left to die? (see Frankham Street). Ongoing maintenance of the high street is sadly lacking. Fancy new stall canopies and outdoor art exhibitions are not going to hide the fact. Another fine example of how all this new stuff just goes to wrack and ruin within months is Deptford Station, which some have said is "approaching dereliction before it is even fully finished". The spanking new surfaces are showing the results of six months of neglect, with dirt, dust and pigeon droppings, staining from spillages on flooring and glass, leaks in the roof, dead pigeon feathers, a shattered glass panel (due to steel tension rather than vandalism), a smell of fish, and the lifts stinking of urine (no toilets, alas!). The rapidly declining state of the new station is thanks to Network Rail or South Eastern's neglect, rather than Lewisham Council's, but goes to show that without cleaning and maintenance, there's not much chance of new public spaces looking – and feeling – good for long. From the mini exhibition this evening we gather that the team working on the Deptford High Street Improvement Scheme have given a lot of consideration to the issues raised above and in our comments section. • The anchor will be moved from the top of the high street, but Giffin and Douglas Squares are not considered appropriate new homes for it since both are used (or will be) for the market and as event spaces. Due to popular demand, however, the "cherished landmark" will not be returned to Chatham Dockyard (from whence it came 20 years ago), but kept in storage until it can be accommodated somewhere. We forgot to ask where the "storage" is – it could well be Chatham. Not a very satisfactory solution for those who have come to regard the anchor as the only visible sign of Deptford's maritime heritage. • The low seating featured in the architectural drawings will not go ahead. There will be no fixed seating since this attracts street drinkers. Never mind that the late night betting community are not worried about sitting down. The team are considering the idea of having a kiosk (or sort of pop-up cafe) that might sell hot drinks etc and which will have non-fixed seating that will be put away at night. Quite why anyone would want to sit outside by the busy A2 for a coffee is beyond this author. And where are they going to store the furniture? The bloke who runs the Wimpy wasn't too happy about the idea either. • Some shop keepers who were concerned about losing much of their shop frontage as the market space is widened will be variously appeased. Some of the more historic shopfronts have been identified to receive improvements, though we're not sure what this means. • The council have entered into a joint PFI (Private Finance Initiative) with Croydon Council which will involve the renewal of all street lighting in the borough and the long term maintenance of its lighting stock for 25 years. • In a time of cost cutting, the chances of ongoing maintenance of new paving etc is too much to hope for. Since there is no money to maintain what is already in place, it is felt that this opportunity to renew the dilapidated street is better than nothing. Other issues dealt with include business waste, parking, traffic flow, the market's future storage needs, and ideas for pulling in shoppers. A forum will be set up consisting of various stakeholders and residents. The team are also working with the police, local organisations and charities to address the issues of street drinking, antisocial behaviour, betting shops, drug dealing and the alarming increase in rough sleeping and homelessness. Tenant Liaison Officer Kerrie Taylor reported at Crossfields TRA meeting on 27 September that only 47 people returned the survey on Parking Permits. 15 were in favour (7 of whom had reservations about the financial impact), but 32 were opposed. Some were not car owners but were concerned about the implications for their visitors and carers, and the dubious practices of the private contractors employed to police the permits. A letter will be sent out to confirm that the Permit Scheme will not go ahead. 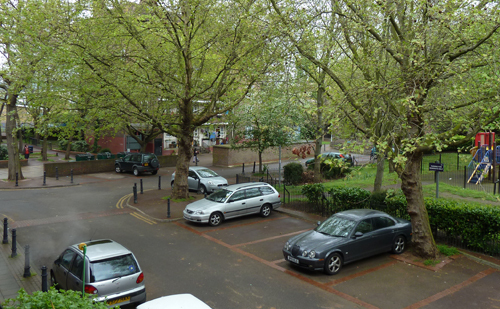 However, since residents attending the meeting from Frankham House claimed to have a greater problem than the rest of the estate due to their proximity to the public car park in Frankham Street where non-residents are avoiding parking fees by using the Frankham House courtyard, it was agreed that a new survey be sent out again to canvas their block only. Kerrie hinted that there may soon be changes to Lewisham's resident parking policy. Meanwhile, the estate's parking areas will continue to be used by non-residents (local businesses, shoppers and Wavelengths users) wishing to avoid parking fees elsewhere, despite signs requesting them not to. Kerrie also reported on her attempt to overhaul the management of the estate's 'pramsheds'. Administration of the sheds lapsed when Lewisham Homes took over from the council. An informal arrangement has grown over time in which some people have taken over more than one shed without paying any rent, whilst one or two have been charged rent for a shed they do not have. Locks have been changed and any keys the rent office may have held have been lost long ago. Kerrie said that her office had received a huge number of enquiries as a result of putting up notices on the shed doors. There were now 213 on a waiting list – obviously more than there are sheds available. She has prepared a report which has to go to a budget meeting on 15th October, where it will be determined whether there are sufficient funds to repair sheds where needed, and to implement a new lettings scheme. There will only be one shed per flat available to those on the waiting list, and those allotted must sign a license agreement to pay the requisite peppercorn rental. 853 » Election 2010: Bored, yet? Zero waste week: are you a waster or a hero? Lewisham, your democracy is dying… but does anybody care? Been awhile, but things are still growing. Labourers, poorer artisans and street sellers. How much has changed from 1898?